After the Confederacy lost the Civil War, thousands of Southerners fled to Brazil in hopes of preserving their way of life. THE CIVIL WAR WREAKED UNSPEAKABLE DESTRUCTION ON THE SOUTH, and on Southerners. It had been, in the words of historian Shelby Foote, “a new kind of war, quite unlike the one for which they had bargained.” In addition to the hundreds of thousands of young men sacrificed in the war, the South was a shambles: Many of its cities had been destroyed, its institutions were in ruins, its currency worthless; crops were devastated, land was selling for a fraction of its former value, and the labor force decimated by the end of the centuries-old institution of slavery. Countless Southerners who had been financially comfortable if not outright wealthy before the war now found themselves destitute, with a questionable future under the thumb of their erstwhile enemies. Although most Southerners would neither have acknowledged nor accepted the fact, President Abraham Lincoln had been their best hope for a return to normality; and with the violent death of the one man who had been resolved to welcome the South back into the Union without recrimination, the future promised to be a bitter one indeed. As an editorial in the Galveston Daily News warned in 1867, “The radical programme of depriving the people of the South of the last vestige of liberty is about to be carried out and…our unhappy country is about to be made the theatre of the most desperate rule the world has witnessed in modern times.” While most people elected to stay and face the changes to come, some anxious and embittered Southerners chose to start life anew on foreign soil. For these disaffected citizens of a now nonexistent Confederacy, the main question was one of destination, not motivation, and countries throughout the world were only too ready to accommodate them. Various nations, seeing in the South’s plight the sudden opportunity to attract a workforce that ranged from common laborers to well-educated professionals to experienced planters, offered impressive financial opportunities in the hope of attracting them. Tens of thousands of Rebels responded. Selling their homes and most of their possessions, they gathered their families and scattered throughout the world, traveling to Europe, Latin America, Canada, and as far as Egypt and Japan. SOME ÉMIGRÉS CHOSE TO STAY CLOSER TO HOME. Bordering American states and territories as it did, Mexico was a tempting destination. To bolster the ranks of his sympathizers against Benito Juarez’s Republican forces, Emperor Maximilian, the head of France’s puppet government in Mexico, offered favorable enticements to former Confederate soldiers and their families. A good number of them responded, most notably, Major General Joseph O. Shelby. After ceremoniously consigning his Rebel battle flag to the waters of the Rio Grande, “General Jo” led his followers south across the border. But the country that presented the most attractive package, and that would ultimately provide the displaced Rebels with a generations-long venue for the preservation of their Southern identity, was Brazil. Southerners traveling through Brazil in the decade before the Civil War had written glowing reports of its climate, soil, and people. And during the war, Brazil had maintained an openly sympathetic policy toward the Confederacy, recognizing its status as a belligerent and providing safe harbors for the refitting and supplying of its vessels. Of further appeal to the Southerners was the fact that Brazil, alone among nations in the Western Hemisphere, still practiced slavery. While it had banned the importation of slaves in 1850, Brazil would not abolish the institution of slavery until 1888. This was an economic system with which the Southerners could identify, even if the great majority of them could not afford to own slaves. Brazil’s emperor, Dom Pedro II, was so eager for the Americans to bring their technological skills and tools—­especially the moldboard plow, which helped in the cultivation of cotton—to his country that, as soon as the Civil War ended, he placed advertisements in Southern newspapers and engaged American agents to present his offer directly to the rapidly forming “colonization societies.” He encouraged professionals to settle in such cities as Rio de Janeiro and São Paulo, and he offered farmers tax benefits and arable land for as little as 22 cents an acre. He also promised to build a system of roads and to establish a railroad to carry the planters’ agricultural products rapidly to market. As many as 20,000 Southerners chose to take advantage of the emperor’s offer. While many were professional people—doctors, pharmacists, teachers, artisans, merchants, machinists—most were farmers, who heard in Dom Pedro’s words the promise of prosperity. Although their colonies of farms and plantations would be built far from the nearest market, the emperor’s commitment to build roads and railroads to accommodate their bountiful harvests presented an irresistible picture. In addition to providing a climate conducive to a variety of crops, including sugar cane, rice, tobacco, coffee, manioc, and corn, Brazil produced cotton crops twice annually. And if there was a crop with which the Southerners were familiar, it was cotton. THERE WOULD, OF COURSE, BE OBSTACLES. Brazil was devoutly Catholic, whereas the great majority of the emigrants were Protestant—Baptist, Methodist, and Presbyterian. Also, by this time, the Brazilian population had become racially mixed—a concept that was alien, and to a large extent repugnant, to the Southerners. The Portuguese language would prove extremely difficult for many of them to learn. And the land itself was vast and often inhospitable. But in the beginning the expatriates were either unaware of the difficulties that lay ahead or chose to minimize them, drawn by the promise of a better life. The Southerners took ship from various ports in the United States for the voyage to Rio. They were well received, feted by the locals, who referred to them as “Confederados,” and occasionally greeted by the emperor himself. Those who chose to establish farming colonies embarked once again to any of a half dozen locations, ranging from Parana in the south, to Santarem along the Amazon, to the area north of São Paulo. Sadly, one by one the colonies foundered because of poor soil, illness, insects, and internal dissension. As historian Cyrus B. Dawsey observed, “Many of the early letters were optimistic, filled with hope; others sent later, however, betrayed the disappointment of lost dreams.” Thousands of the disillusioned colonists pulled up stakes and moved back to the South. The colony conceived and overseen by Frank McMullan, a charismatic Texan, was typical. Established on the São Lourenço River just south of São Paulo and named Lizzieville after McMullan’s late wife, it showed promise until his own untimely death from tuberculosis in 1867. His settlement soon fell apart, largely because of internal power struggles. This was the colony that George Barnsley, the Georgia planter and former Confederate physician, had joined, and in a letter home to his father, he listed several reasons why most of McMullan’s followers elected to return to the South: “dissimilarity of language and customs; difficulties of transportation; low price for skilled labor; differences in religion; inability to vote and be sovereign….and finally—and most potent of all—…this country offers and gives nothing for the American, which he cannot get in his own country—nothing worth the sacrifices of exile from his native soil and kindred.” Barnsley joined the thousands of his fellow planters from the various colonies who chose to return home. The country south of Santarem, a trade settlement and Jesuit mission the Portuguese built some 200 years earlier, proved even less hospitable. “Santarem is located in one of the world’s most isolated and underdeveloped areas, where even Brazilians have historically feared to tread,” Confederado descendant and chronicler Eugene C. Harter wrote. “It swelters in the midst of the 2,200-mile-long Amazon River.” Nonetheless, the soil was rich, and for a time the Southerners “hung on with tenacity,” as one of them put it, and although the colony itself would soon cease to be, some individual planters managed to do well on their own. The fields around Santarem in which the Confederados planted their crops were littered with potsherds—clay remnants of an ancient Amerindian culture. As they plowed the black soil, the new settlers unearthed countless fine examples, including detailed bird and animal figures. Romulus J. Rhome, a successful tobacco and sugar cane planter and one of the few Confederados to own slaves, accumulated an extraordinary collection of artifacts, part of which eventually found a home in Brazil’s National Museum. These artifacts, as well as the additional presence of fossils and bones, made Rhome and others aware of early indigenous habitation, and their discovery and analysis led to a new discipline of archeological study in Brazil. Ironically, the Santarem colony itself was destined to become a part of the region’s past, as most of its members left or were absorbed into local communities. Ultimately, the São Paulo settlement became the only successful colony. William Norris, a leather-tough former congressman and Confederate officer from Alabama, had selected an ideal location for his colony in the highlands of São Paulo, near Santa Bárbara d’Oeste. His choice of location was a natural one; as his great-grandson James Jones recalled, “The rolling country and the soil were just like Alabama.” Norris proceeded to establish his colony on fertile soil, annd it thrived. Word of the colony’s success spread, and as other colonies fell like so many dominoes, many of the disappointed planters moved to Norris’s settlement. Soon, some 100 families were living and farming in proximity. The planters in São Paulo prospered, using American tools—rakes, harrows, spades, and especially the moldboard plows—that most native Brazilians had never seen. Their ingenuity was evident in the improved cultivation of local crops as well as the successful introduction of such Southern staples as rattlesnake watermelon and pecans. IN 1875 A LONG-PROMISED RAILROAD REACHED THE NORRIS COLONY, and the settlers established a depot for their crops not far from Santa Bárbara. The depot soon grew into a town, which the Confederados dubbed Americana. By 1890 Villa Americana was home to some 500 Confederado families. Today it is a city with a population of around 230,000. On its coat of arms is the Confederate flag. The Confederados’ early exclusionist attitude was reciprocated by the locals, at least with respect to religion. When the wife and two daughters of former Rebel colonel A. T. Oliver died of fever during the family’s first year in Brazil, the local Catholic Church refused them burial in their cemetery. Oliver therefore set aside for his fellow colonists a two-and-a-half-acre section of land, which has come to be called “Campo,” to be used exclusively as a Protestant chapel and cemetery. The chapel became both the religious and social center for the emigrants, hosting Baptist, Methodist, and Presbyterian preachers on rotation. The cemetery today contains some 500 graves of the original colonists and their subsequent generations, each displaying a miniature Rebel flag and bearing a typically Southern name: MacKnight, Easton, Ferguson, McFadden, Jones. The graves are shaded by pines, the seeds for which were brought from Alabama a century and a half ago. Each year, the Fraternidade Descendência Americana—the Fraternity of American Descendants, founded in 1955—holds a festa, or pageant, to raise money for the upkeep and preservation of the chapel and cemetery. 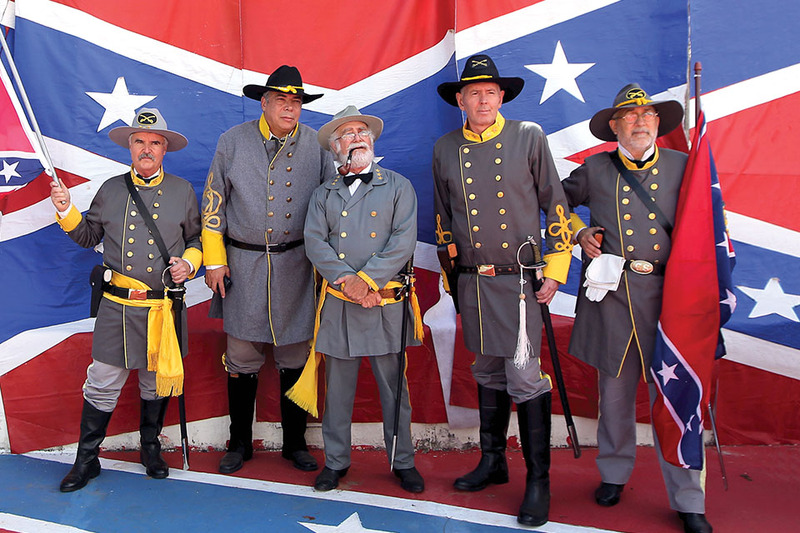 Male festa participants dress in stylized Confederate uniforms and the women wear ballgowns, some of which display the “Stars and Bars”—the Confederate battle flag. They dance to the strains of “old-timey” fiddle tunes, while such traditional comestibles as southern fried chicken and vinegar pie are sold at the vendors’ booths. ANOTHER VESTIGE OF THE PAST TO WHICH THE CONFEDERADOS clung throughout the generations was what one historian described as their “rebel spirit.” This was clearly evidenced in July 1932, when they joined the native population of São Paulo in what has come to be called the Brazilian Civil War. Two years earlier, politician, soldier, and opportunist Getúlio Vargas staged a coup in which he ousted the duly elected president, a native of São Paulo, and set himself up as dictator. Seeking to centralize and increase the federal government’s powers over the nation’s cities and states, he suspended the Brazilian Constitution. RON SOODALTER, a frequent contributor to MHQ, is the author of Hanging Captain Gordon: The Life and Trial of an American Slave Trader.